Did a chill run down your spine during the 11:30 p.m. hour last night? That’s probably because you heard the sound of Jimmy Fallon’s giggle as he played nice with Donald Trump on The Tonight Show. It was unlikely that the affable host would hit the Republican presidential candidate with the tough questions—he hasn’t on previous occasions—but the interview was almost unnervingly chummy given that it mostly consisted of Fallon fawning over Trump. The host didn’t challenge Trump after he said he “know[s] nothing about” Vladimir Putin, and even complimented the way the orange-faced reality star responded to Democratic nominee Hillary Clinton’s recent experience with pneumonia and dehydration. (Um, Trump went on Dr. Oz to imply his opponent wasn’t fit to serve.) And then the hair-tousling happened. 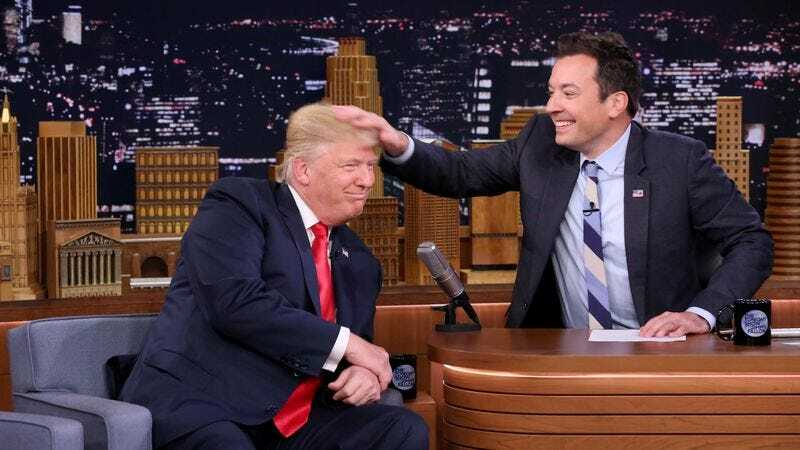 Fallon asked if he could do something with Trump he wouldn’t be able to do if he’s president, and then got permission to run his fingers through that stringy mane. Rather than recoiling in terror, Fallon smiled gleefully. Clinton is scheduled to appear on The Tonight Show Monday, presumably while wearing a hat.